Who is James Robinson III, the Author of Concepts in Health & Wellness? James Robinson, III is currently professor and graduate coordinator in the Department of Public Health Sciences at New Mexico State University. He taught health education for nine years in the Downingtown Area School District, Downingtown, Pennsylvania. After his doctoral studies, Dr. Robinson held faculty appointments at California State University at Northridge, the University of Northern Colorado, Texas A&M University, and Texas A&M Health Science Center. His health education consultations include school districts in California, Colorado, Texas and Wyoming, as well as the state health and education departments in Colorado and Texas. What is Concepts in Heath and Wellness? CONCEPTS IN HEALTH AND WELLNESS is the ideal book to provide you with essential personal health information you can use to develop a lifetime of wellness skills. This book is approachable, inviting and straightforward and will help you develop the knowledge and motivation you need to maintain wellness throughout adulthood. More importantly, this book will empower you with the skills to access credible health and wellness information now and in the years to come. 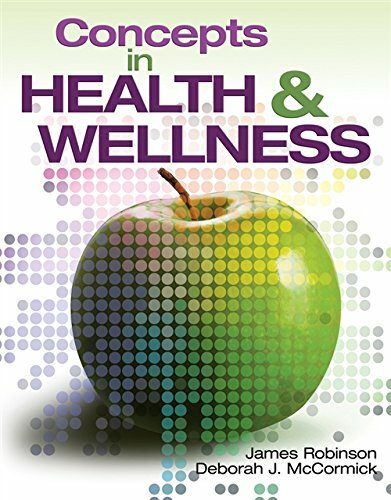 CONCEPTS IN HEALTH AND WELLNESS meets the diverse needs and interests of readers regardless of the academic setting and is written in a style that is easily understood at all levels, but especially at the community college level. The book is 576 pages easy to read and has a wealth of information everyone should read! More on Dr. James Robinson III? Dr. Robinson is author or co-author of more than twenty five professional publications and has delivered more than seventy five professional presentations to local, state, and national audiences. He is lead author of ESSENTIALS OF HEALTH AND WELLNESS, a health textbook for high school students, and is currently the Executive Editor of the Journal of Drug Education. Dr. Robinson has served on numerous committees and boards of the American Association for Health Education and the American School Health Association. The American Association for Health Education honored him with Fellow status in 1999 and with the association’s Professional Service Award in 2003. In addition to his teaching, scholarly activity, and service, Dr. Robinson has generated approximately two and half million dollars in grant support for his research and health promotion projects. He received his Bachelor of Science Degree in Health and Physical Education and his Masters Degree in Education in Health Education from West Chester University. He received his Doctorate Degree in Health Education from the University of Northern Colorado. Next PostWhy including vegetables is important in the diet?